"Sorry to hear of the loss of such a Beautiful Christian..."
"Our prayers are for the entire family. At times like these,..."
"Forever in our Hearts we will surely miss you Mrs. Taylor"
"We are truly saddened by the passing of Aunt Valaida. Our..."
A resident of Baker and a native of Clinton died Sunday, February 10, 2019 at The Carpenter House of St. Joseph Hospice. She was 77. 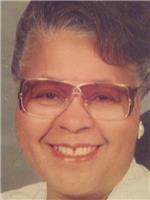 She was home-maker, retired cosmetologist, and a member Freeman Baptist Church of Ethel, LA. Visiting will be Thursday, February 14, 2019 5:00 PM to 7:00 PM, at Richardson Funeral Home, 11816 Jackson Street, Clinton. Funeral Service will be Friday, February 15, 2019 12:30 PM at Freeman Baptist Church, 4628 Hwy 955 W, Ethel. Pastor Perry Jones, officiating. Interment will be in the Louisiana National Cemetery, Zachary, LA. She is survived by her husband of 3 years; DeSoto "Bobby" Jackson, one daughter; Greshlyn Renee Taylor, four grandsons; Brandon D. (Krystal) Jones, Talmadge D.(Terrilyn) Jones, Lemuel D. Jones(Kristie), Taylor D. Jones all of Baker, five great-granddaughters; Briel Jones, Brooke Jones, Lynnix Jones, Logan Jones, and Neelah Jones. Preceded in death by former husband, Johnny Lynn "Judge" Taylor. Arrangements entrusted to Richardson Funeral Home of Clinton (225) 683-5222.